Strongiloidoz (strongyloidosis; anguillas) - helminthiasis, in the early phase of which is dominated by allergic phenomena in the skin and lungs, in the later phase - lesions of the intestine. Fig. 1. E. price: 1, Mature female (parasitic generation); 2 - male (free-living generation); 3 - the female (free-living generation). Fig. 2. 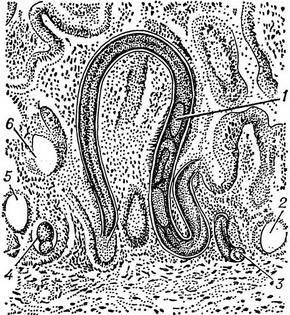 (right) E. prize in the wall of the small intestine: 1 - adult; 2, 5 and 6 - cavity formed by the parasite; 3 and 4 - larvae. Etiology. 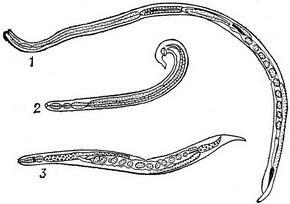 Pathogen - round worms - intestinal price (Strongyloides stercoralis). The length of the male 0,7 mm, length females 2 ml (Fig. 1). Mature females who was the thickness of the mucous membrane duodenal ulcer, sometimes just the small intestine, the blind and the transverse colon, as well as in the bile and pancreatic ducts (Fig. 2). Females lay eggs that hatch and go into the lumen of the intestine larvae released from faeces into the environment. Person contracts strongyloidosis the penetration of Mature larvae intestinal ugritsy through the skin or through the mouth with food and drink. Through the blood or lymphatic system larvae are recorded in the lungs, which are promoted by pneumatic ways throat, swallowed with saliva and sputum and enter the intestine. In the process of migrating larvae reach sexual maturity. Fertilization females occurs in the lungs, and then the males die. Epidemiology. Strongiloidoz widespread in countries with tropical and subtropical climates, but occurs in countries with a temperate climate, including in the USSR. Pathogenesis and pathological anatomy. The pathogenesis of strongiloidoz associated with sensitizing and mechanical influence of the parasite on the body. Pathological changes are defined mainly in the gastrointestinal tract: swelling and redness of the mucous membrane with hemorrhages, erosion, hyperplasia of the lymph nodes and lungs - eosinophilic infiltration. The clinical picture. In the clinical course of strongiloidoz distinguish two phases. In the early phase, when the larvae migrate into the body, appears fever, skin itching, urticaria; in blood eosinophilia; chest x-ray of the lungs eosinophilic infiltration. In a later phase, when the worms reach sexual maturity, in the light forms are observed nausea, dull pain in podlojecna area, cal decorated or pasty consistency; if severe vomiting, a sharp pain in the Abdomen, periodically liquid stool up to 5-6 times a day, sometimes e admixture of mucus, less blood. In the blood eosinophilia, sometimes secondary anemia. When particularly severe clinical course diarrhea become continuous, feces becomes putrid smell. Comes dehydration, secondary anemia, cachexia. The prognosis is generally favorable. Laboratory diagnosis is crucial and is based on the detection of larvae Strongyloides stercoralis in fresh faeces method Bermann, the duodenal contents, rarely in the sputum (see Helminthological research methods). Treatment is carried gentian violet or thiabendazole. Gentian violet is prescribed in capsules after eating adult 0.08-0.1 g 3 times a day; children a single dose - 0,005 grams daily - 0.01 g on 1 year of life. The cycle of treatment is 15 days; through 1-11/2 months. spend the second cycle duration-7-10 days. Thiabendazol appointed interior 2 consecutive days in a daily dose of 25 mg per 1 kg of body weight of the patient (adult about 1.5 grams per day). Prevention is to sanitary improvement of the populated places. For the purposes of personal prophylaxis recommended to be washed thoroughly and pour over boiling water and fruits and vegetables consumed raw.